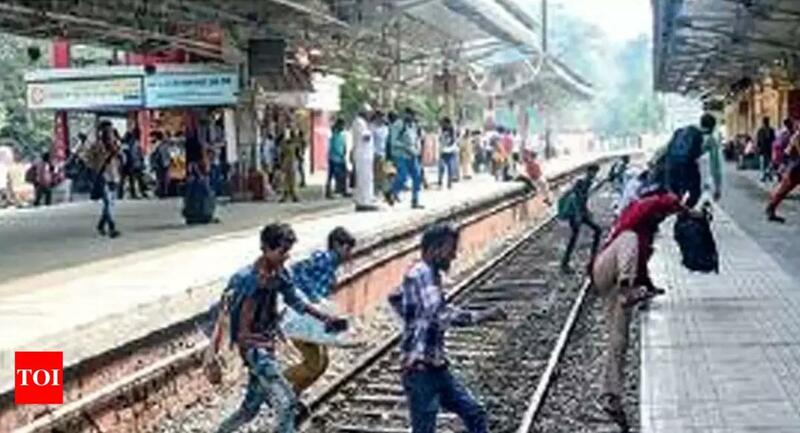 CHENNAI: Putting their lives at risk, commuters at Chennai Park railway station often walk across the tracks to cross platforms, despite the presence of a wide foot over-bridge (FOB). The station is one of the busiest in Chennai with a daily footfall of 30,000 and is an important transit point for commuters moving from the southern areas to the northern and western suburbs. “They should be willing to follow rules. This also applies to those travelling on the train’s footboard,” the official said. While railway officials express their helplessness, commuters say using the FOB is difficult as the station is crowded and it takes more time during the peak hours. “Jaywalking on tracks is dangerous. But Railways should pump in more funds and install escalators which are more comfortable than FOBs,” said Rajendra Babu, a businessman who frequents the station. Another commuter Elumalai suggested that CCTV cameras should be installed to monitor those who cross tracks. “The station has adequate facilities. The FOB is wide enough,” he said. Railway authorities say they are helpless because people are willing to pay the penalty, yet repeat the offence. “There are nearly 25 minor and major accidents at the station every day. Still people don’t learn,” said an official on condition of anonymity. Change has to come from the people, he said. The official, however, admitted that installing escalators will curb this menace. Chief Public Relations Officer (CPRO) of Southern Railway PA Dhananjeyan did not respond to calls seeking comment.